Seizures in a newborn are often the first and only clinical sign that the baby has a brain injury. The most common cause of seizures in a newborn is hypoxic ischemic encephalopathy (HIE). Thus, when seizures occur, the baby should be promptly evaluated for HIE. In addition, seizures must be promptly treated because they can cause problems with the body’s regulatory functions and affect breathing, temperature and oxygen uptake. Seizures can also worsen existing brain injury and cause further permanent brain damage. Many types of neonatal seizures are associated with cerebral palsy, intellectual disabilities, developmental delays and epilepsy. Hypoxic ischemic encephalopathy and seizures must be promptly diagnosed because there are treatments available for both conditions. If left untreated, the conditions can cause permanent and severe brain damage and lifelong problems, such as cerebral palsy. Treatment for hypoxic ischemic encephalopathy is only available within a 6 hour window following the insult that caused the HIE. Since HIE in a newborn is often caused by an injury occurring during or near the time of delivery, a diagnosis must usually occur within the first 6 hours of the baby’s life. Treatment of HIE may also help prevent future seizures and resultant epilepsy in the child. If your baby has HIE, a seizure disorder, cerebral palsy or any other birth injury, email or call the award winning attorneys at Reiter & Walsh ABC Law Centers. Unlike other firms, the attorneys at Reiter & Walsh focus solely on birth injury cases and have been helping children throughout the nation for almost 3 decades. The partners of the firm, Jesse Reiter and Rebecca Walsh, were recently recognized as being two of the best medical malpractice lawyers in America by U.S. News and World Report 2015, which also recognized Reiter & Walsh ABC Law Centers as one of the best law firms in the nation. In fact, U.S. News and World Report has given Mr. Reiter the honor of being one of the “Best Lawyers in America” every year since 2008. Call us today; our toll-free number is 888-419-2229. We give personal attention to each child and family we help and our firm’s hypoxic ischemic encephalopathy attorneys are available 24 / 7 to speak with you. Hypoxic ischemic encephalopathy (HIE) is a brain injury caused by a lack of oxygen in the baby’s blood (hypoxia) and / or a restriction of blood flow (ischemia) in the brain. There are numerous conditions that can occur during labor and delivery that can cause a baby to experience oxygen deprivation and resultant HIE. These conditions include umbilical cord, placenta and uterus problems; hyperstimulation caused by the labor drugs Pitocin or Cytotec; and brain bleeds, clots and strokes caused by vacuum extractors, forceps and trauma during delivery. The uterus (womb), placenta and umbilical cord are very important in the delivery of oxygen to the baby. The baby’s source of oxygen comes from oxygen-rich blood delivered to her from the mother. The blood travels through vessels in the uterus and placenta (called uteroplacental circulation), and then to the baby through the umbilical cord. When complications occur that affect the blood flow to the baby, the baby can become severely and even completely cut off from her supply of oxygen. These complications include placental abruption, uterine rupture and umbilical cord wrapped around the baby’s neck (nuchal cord). Pitocin and Cytotec can cause contractions to be so strong and frequent (hyperstimulation) that the placenta is unable to properly recharge with a fresh supply of oxygen-rich blood for the baby. This can cause oxygen deprivation that gets progressively worse. In addition, hyperstimulation increases the baby’s risk of having a brain bleed. Use of the delivery devices forceps and vacuum extractors also place a baby at risk of suffering brain bleeds and hemorrhages because they attach to the baby’s head and are used to pull the baby out of the birth canal. If a baby is too large for the size of the birth canal, a condition called cephalopelvic disproportion (CPD), a vaginal delivery will be impossible, and attempts to deliver this way can cause severe trauma and brain bleeds in the baby. Gestational diabetes places a baby at risk of growing very large (macrosomic). Not only does macrosomia increase the baby’s risk of experiencing a traumatic delivery, but it also increases the risk of shoulder dystocia, which is when the baby’s shoulder gets stuck on the mother’s pelvic bone. Macrosomia and shoulder dystocia increase the chance that physicians will use forceps and vacuum extractors during delivery. When these conditions occur, a C-section delivery is often the fastest and safest way to deliver the baby. Indeed, the conditions discussed can have very serious consequences for the baby, including hypoxic ischemic encephalopathy (HIE), seizures, cerebral palsy and epilepsy. However, if the medical team closely monitors the baby’s heart rate with the fetal heart monitor, signs of oxygen deprivation in the baby, called fetal distress, can be recognized right away and the physician can quickly deliver the baby to get her out of the oxygen depriving conditions. Most often, an emergency C-section is performed when fetal distress is present. Brain injury and HIE often occur when the medical team either fails to properly monitor the baby’s heart rate or fails to recognize fetal distress on fetal heart tracings, thereby leaving the baby in the womb when oxygen deprivation is taking place. When a baby experiences a lack of oxygen to her brain for a prolonged period, numerous events begin to take place that can damage the brain. The extent of brain injury depends on the length of time the brain went without oxygen, the severity of the oxygen deprivation, the condition of the baby (fetal reserve), and the medical management of the baby after the brain insult. The only treatment for hypoxic ischemic encephalopathy is hypothermia (brain cooling) treatment. This treatment involves using a cooling cap or blanket to cool the baby’s core body temperature to a few degrees below normal for 72 hours. The key with hypothermia treatment is that it must be given within 6 hours of the insult to the brain that caused the baby’s HIE. The more severe the HIE, the sooner the treatment should be given. Hypothermia treatment has been shown to lessen the injurious process that starts to occur when the brain experiences an oxygen depriving / ischemic insult. Studies show that hypothermia treatment significantly decreases the baby’s chance of developing cerebral palsy, and the treatment can also decrease the severity of the cerebral palsy. WHAT ARE THE CAUSES OF SEIZURES AND WHAT ARE THE TREATMENTS? A seizure is a sudden disruption of the brain’s normal electrical activity. The abnormal electrical activity is accompanied by altered consciousness and other neurological and behavioral signs and symptoms. Seizure activity can be located in one part of the brain or it may occur on both sides. Seizures can be caused by brain damage, neonatal hypoglycemia, metabolic problems and other conditions that affect brain activity. Epilepsy is a general term for the tendency to have seizures. It is critical that the underlying cause of seizures be treated. After initial management of airway and cardiovascular support for the baby and diagnosis and treatment of the underlying cause, the physician must decide whether to initiate antiepileptic drug (AED) therapy. Factors to be taken into consideration include whether the seizure is epileptic in origin. If it is, the seizure duration and severity must be examined. Phenobarbital is usually the first drug of choice because it is relatively effective, the side effects are well appreciated, and the way it works is well understood for term and preterm infants. Phenobarbital is eliminated by the liver and kidneys. Thus, if a baby has impaired kidney or liver function, which often is the case with HIE, the standard dosing could be toxic. The younger the baby, the higher the likelihood of toxicity. When seizures are unresponsive to AEDs, pyridozine (a B vitamin) should be given to the baby. If there is no response to this, folic acid (B9) may be administered. Determining the underlying cause of seizures is critical because many times, drugs will not be effective in controlling seizure activity until the underlying cause is treated. Furthermore, the medical team must make every effort to prevent seizures and minimize seizure activity and severity. Babies at risk of having seizures and that have had a seizure must be closely monitored. Sometimes the only sign of seizure is activity on an EEG. Cardiopulmonary monitoring devices may also alert the medical team that the baby may be having a seizure. One sign of a seizure is apnea, and monitoring devices can detect this. In addition, respiratory rate and heart rate may change during a seizure, which also can be detected on a monitor. Many times, a seizure can be observed. If anyone on the medical team witnesses signs of a seizure, such as the body going limp, the baby losing consciousness, or the baby staring and / or making bicycle “pedaling” movements, EEG monitoring and diagnosis of seizure activity must promptly take place. Very close monitoring must also occur if AED therapy is initiated. This treatment can be dangerous. In addition to standard monitoring, blood levels of the drugs must be monitored, as well as liver and kidney function. HOW DOES HIE CAUSE SEIZURE ACTIVITY? When HIE occurs, there is a cascade of events that cause a decrease in energy production in the brain, which can cause excessive excitation of brain impulses and seizures. Since hypothermia treatment can decrease the amount of brain damage that occurs after a hypoxic / ischemic insult, the treatment may be able to help prevent seizures. 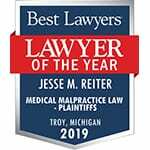 Jesse Reiter, partner at ABC Law Centers, is the only attorney in Michigan who has spent his entire 28+ year career focusing on birth injury cases, and most of his cases involve helping children who have hypoxic ischemic encephalopathy and cerebral palsy. When Jesse and his team of attorneys take a case, they spend a lot of time getting to know the child and family they are helping so they can fully understand the child’s needs. Jesse and his team of hypoxic ischemic encephalopathy attorneys have won many awards for their advocacy of children. Jesse is currently recognized as being one of the best medical malpractice lawyers in America by U.S. News and World Report 2015, as well as one of the 10 Best Attorneys in Michigan by Super Lawyers magazine. Reiter & Walsh ABC Law Centers is also recognized as being one of the best medical malpractice law firms in the country by U.S. News and World Report 2015. Hypoxic ischemic encephalopathy (HIE) and birth injury cases are difficult areas of law to pursue due to the complex nature of the medical records. The award winning lawyers at ABC Law Centers have decades of experience with cerebral palsy and HIE cases. We handle cases in Michigan, Ohio, Washington, D.C. and throughout the nation and we give personal attention to each child and family we help. We have numerous multi-million dollar verdicts and settlements that attest to our success, and no fees are ever paid to our firm until we win your case. Email or call us at 888-419-2229. In this video, hypoxic ischemic encephalopathy attorneys Jesse Reiter and Rebecca Walsh discuss the causes of birth asphyxia, HIE and seizures.